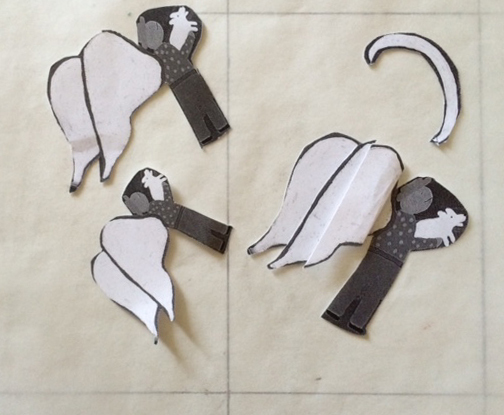 Previously in the Bat Image blog post I showed you the nuts and bolts of how I make a tactile picture. In this post I will show you how I think about modifying an image to maximize effectiveness. 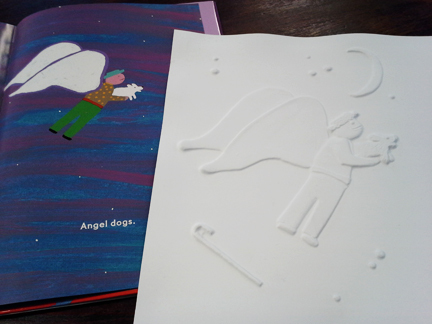 A little while ago National Braille Press asked me to create a tactile image for a new children’s book release. I am always happy to work with Diane Croft, publisher, at the Press. 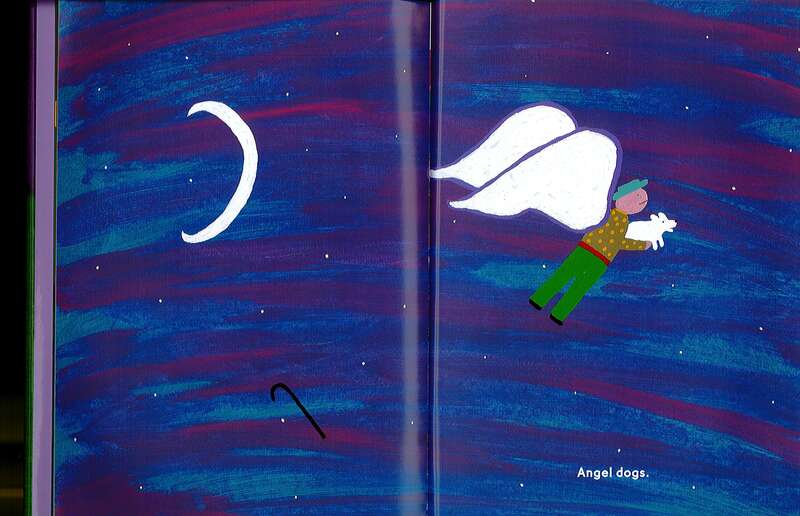 She sent this image from the book by Cynthia Ryland titled Dog Heaven. Ryland paints a warm and affectionate picture of the ideal place where dogs who die go to “run and run in expansive fields” and munch on doggie biscuits. The purpose of the book is to offer some comfort to grieving dog lovers. I decided that the most important part of this image is the interaction between the winged figure and the dog, so I wanted this to be as large as possible. Knowing that the finished page size is 8.8″ x 12.5″, I started fitting different sizes of the image on the page. I thought the wings were important but the idea could be conveyed if I were to keep them top to bottom in the same relationship to the figure. So I diminished the width of the wings in order to fit a much larger figure on the page without compromising the spirit of the image. 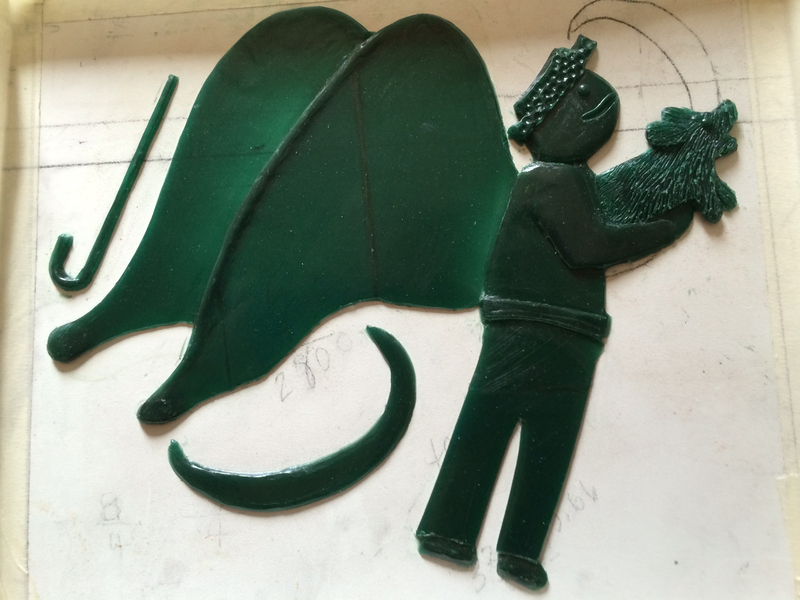 With the image this size, it was now possible for me to make a sculpture in which the arms could clearly be felt to be cradling the dog. The enthusiasm of the dog could be felt in his alert posture. The man’s smiling lips can also be easily felt. Now, when the man and dog are positioned on the page along with the moon, the stars, and a cane, they are all easy to find. To purchase Dog Heaven click here. To see how tactile images are made in the Bat post click here. And finally, if you would like to receive notifications of future blog posts, leave your email address here to sign-up for twice monthly email notices. Today Julie Deden, Dan Burke have agreed to examine two tactile landscape images to discover what they are able to see in each image. I have added verbal description of each picture in the video for the benefit of my blog visitors. I did not explain either image to Dan or Julie before they began looking. I did little editing of this interaction so that you can hear their thoughts as they explored. The second piece Ghost Dog is a work in progress and I will use the information I gathered from our discussion to finish this piece. I’ll post the finished image in two weeks. Stay tuned! To watch this video click here. It is less than 20 minutes long.